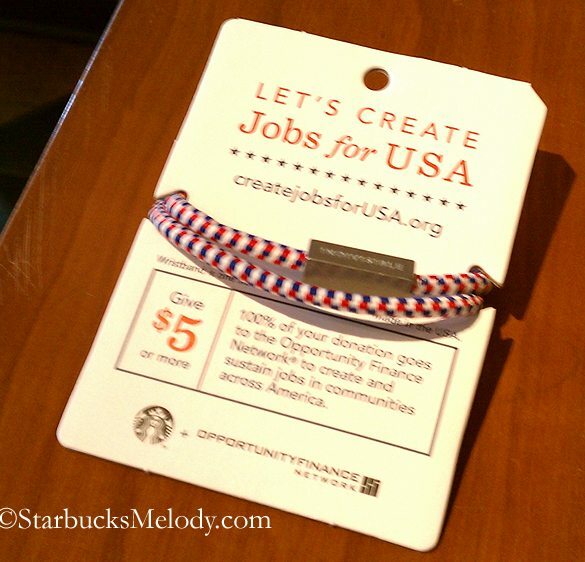 Starbucks has partnered with the Opportunity Finance Network and is launching the Create Jobs for USA program today. The program is designed to spur jobs all over the U.S. with loans to small businesses. It all starts with you donating $5 at the register, and you get a red, white, and blue Made-In-The-USA wristband. The donation money goes to the Opportunity Finance Network which is a network of Community Development Financial Institutions – private financial institutions that are 100% dedicated to delivering responsible, affordable lending to help low-income, low-wealth, and other disadvantaged people. So what do you think? It will be interesting to see if the bracelets really sell. I think they will. How are they selling at your store? Well, hopefully they’ll sell a little better than Onward, which took a while to sell all those in-store copies. Please excuse the snarky comment! Well, I think most people who bought copies of Onward did so through retailers like Amazon.com, or Barnes & Noble, or purchased Onward to attend promotional Onward Book Tour events which required the purchase of the book, and not actually in the stores. You can buy the wristband online too. Downtown Olympia, WA Starbucks - Featured Clover store. Sitting in my Favorite Starbucks drinking my first official mug of Thanksgiving Blend, it’s okay but will be better when I brew it at home. Holiday red cups are back too. No Jobs for USA bracelets out yet. The Partners are still scurrying unpacking the boxes that arrived later than usual this morning. I will buy one when the find them. Sure it’s just a token show of support for jobs in the USA and the grumps can find fault with anything Starbucks does. But my response is “then what are you doing for the good of the country”? Beautiful fall day in th Tri-Cities, nip in the air, clear skies, and beautiful tree colors (I got my favorite window seat). Finally my local SB got its power back and got there today. Bracelets were out on display and Melody thanks for explaining more fully the program. The ad in the paper could have been a bit more detailed. Also, new holiday cups are out! I guess with an early snowstorm it would seem appropriate to have holiday items out, but it still is a bit too early for me. I thought about you when I saw the bracelets today. Glad to see your post about it. The red cups caught me by surprise today. Noticed the fox was back. Maybe Christmas espresso will make a return too (and perhaps Huxley)? I knew there was something else I wanted at Starbucks today. Remembered the wristbands but forgot the Thanksgiving blend. @LisaC – 50% isn’t bad. You can get Thanksgiving Blend tomorrow. @CD and @Pencil_to_paper – Waves hi! CD, did you get a wristband? Hi Melody. I didn’t get a band b/c I was in a hurry. I’ll get one tomorrow. Also just saw on starbucksstore.com that Christmas Espresso is returning. I grabbed two with my morning coffee, one for me and one for the hubby. I was actually excited about getting them today. However, I noticed not one but 5 or more people pick one up and then put it directly back on the display. Same thing during my afternoon coffee run. I got a little annoyed at the apathy of some. Here is just a tiny little something that one person can contribute to that just might make a difference. Just one little thing. Thanks Melody! I was happy to see that you wrote a blog about it. Maybe more will take notice. @SuzanneC – You’re welcome. I couldn’t pass up a blog topic on this though the news is saturated with articles about this. I didn’t notice a lot of people buying the wristbands (yet) but hey I did notice people buying Thanksgiving Blend. I saw these today, but I didn’t know what there were or did (line was long so I didn’t take the time to read them). But it sounds like a wonderful program, I will definatly buy one tomorrow, I mean in theory this sounds great and if enough people buy them who knows how much money could be raised and what will be accomplished! Love the bracelet and what it stands for but I’m guessing it won’t be sold here in Japan. I think it’s really great how Starbucks gets involved in various programs! Today bought my wrist band. Also, as said elsewhere at my local SB there seems to be so far no interest in the bands. I am not sure they are properly being marketed in the stores. I picked up a bracelet this morning. I can send it to you by way of Melody of you’d like. As usual, back at my favorite Starbucks this morning. Wow it’s busy, but my window seat was reserved 😉 . The store manager saved me a wristband, there were none left on the display. She said they sold out by mid-afternoon, one customer bought 60 of them for gifts. She was able to get some more from another store that has grumpy customers 😉 , but will now be out until next order comes in she knows not when. Dad Cooks so interesting how the wristbands were sold out at your local SB. How many SB locations are there near you? Just curious are the partners at your store promoting the bands or being in WA is it just that more people are aware of them? @purple1 — there are 13 Starbucks within a 10 mile radius (after all we are considered “remote” 😉 ). The Partners are pretty “soft-sell” when it comes to promotions, just a gentle mention. At this Starbucks there is a large contingent of small business regulars who are very business aware. I would say most sales were due to awareness rather than presentation. I’d like one of these, but we are not selling them in Canada. I’m headed to Virginia for US Thanksgiving though, so I’ll look around for one then. I work for a small company that is locally owned and operated. and we have had some hard time these last few months. Was more than happy to get my wristband today. Thanks Howard. Can’t wait for xmas either. would love to get one of those planners now!!!!!!!!!!!!!! Thanks mel for the coffee. I am working on a special handmade project to send to you. Picked up one today. Saw them yesterday, only a few were in the display rack last night. Today there were two racks up, along with a newsprint brochure explaining the project. It says that 100% of your donation goes to the project, and the “Starbucks Foundation is seeding this project with $5,000,000”! The barista that I bought it from didn’t discuss the bracelet at all, but I heard another barista explaining (quite well) to a couple what the project was about. On the East Coast I have seen absolutely no promotional material about these bracelets at all! Nothing. Partners are not promoting them. I purposely took mine off before I walked into two different stores just to see if any Partners suggested them. Not a word from anyone. Good program but not if anyone doesn’t know about it. @LatteRose – That’s a great story. I sort of think the wristband can be a little tough to try and explain in the length of soundbite at the register. There isn’t any time for conversation really at the register if there is any line behind you. @TimSandor – Do you mean the international Starbucks planners? The US doesn’t get planners anymore. I think we had them years ago. The international markets still get really great Starbucks planners, especially Indonesia. It looks like Starbucks is working hard on awareness. I saw one ad on tv for these. There are some flyers printed at the registers by Good Sheets. (Anyone remember those?) Howard was on the today show talking about them. Oh by the way, I think tomorrow is the quarterly conference call. I assume we will here great things when it comes to profitibility. I saw these wristbands by the register today, but nothing was mentioned about them/what they are. I knew what they were, but for some reason, it just didn’t ‘click’ at the time. I’ll buy one tomorrow, though. I think it’s a wonderful thing – it’s certainly someone doing something, and it’s nice to see someone at the head of a business trying to give back to the communities that built his company by trying to seed jobs into those communities. The thing that bums me out is that there’s no consideration for the drive thru in the promotion of it – I’ve been thinking about a way to create a display for the DT. So far, they’re not selling much at my store, but I’ve seen customers look at them, and pick up the newsprint. I try to talk to people about it when I notice them checking it out. I must say I am pleasantly surprised! When I first heard of this “promotion”, I cringed at the thought of being asked for a donation every time I went to Starbucks! Not only does the display next to the register explain the program without need for the barista’s intrusion, the bracelets make me feel part of something after I’ve donated. The bracelets are actually pretty cute! And have more to them than they do at first glance. They’ve got some weight to them & the band is pretty thick. It is actually less like a hair band than it looks. I like the concept of it too, but not sure exactly how much of the money from the sales will go to funding more jobs. They should make that super clear on the packaging- that way people know exactly where their dollars are going! It is a shame about the planners. would love to get one. would be well used as well. I am looking forward to seeing what the holidays offer this year in the starbucks world in the usa. ANy hints Mel? Is our mouse making a return????????? Although I do find the bands are moving a bit slower here than in WA, I did notice today that more were sold. There seems to be no marketing effort by the partners unless you ask a question. When speaking with the ASM today, she seemed somewhat blaise about it . I am glad to see, however, that people are buying them. On another note – I haven’t noticed anyone mentioning the availability of sugar-free mocha and sugar-free peppermint mocha. I think a lot of people will be happy … one barista started to go into the “I can make it non-fat and no whip, but …” then caught herself. I say yay! I’ve had four already. Basically, we’re not supposed to make people feel that they are obligated to donate. If someone expresses interest, or is seen looking at the materials, we take that as our opportunity to talk it up, rather than being pushy sales people, with the hope that other people around will hear the information as well. I picked up one for me and one for Jordan: http://twitpic.com/7bknz8 so I’m set. Not to mention I got 5 donations today alone! It’s slowly starting to take off, and people genuinely seem interested in the program! Not only did I get to donate to a worthy cause and get a cool bracelet, but I paid for it off my registered partner card AND it was the 15th transaction to get me a Free Drink Card! What an awesome experience all the way around! BCav when you got the wristband did you also get a drink? I did not realize the wristband qualified as a transaction towards a free drink. Or is this a reward on the partner only card? Starbucks issued a press release yesterday promoting the fact they have raised $1 million from sales/donations and when coupled with the $5 million donated by Starbucks, the total raised comes to $6 million.